Supergirl ends its third season by wrapping up the Reign plot and looking ahead to what the show will cover next season. The past few episodes have been problematic to say the least with a focus on story over character making it difficult to emotionally invest in anything that was going on. 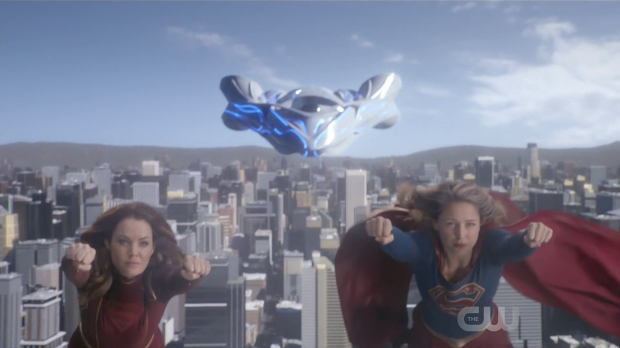 Kara’s reunion with her mother and a large amount of her people was completely undersold which meant that the necessary emotional impact to make a reveal that breaks Kara’s motivation work. To its credit this episode doesn’t attempt to make this work, instead choosing to more or less push it aside in favour of setting up things that will be covered in future. I have to admit that I have a certain respect for the recognition on the part of the writers that certain things haven’t been working leading to an episode that casually wraps those things up without really trying to make sense of them. Of course that doesn’t really make for good storytelling as it amounts to a weak resolution of a weak plot but I can’t really think of any better way to resolve any of this in a satisfying way short of claiming it was all a dream and starting all over again. With that in mind the episode gives almost no time to the Kara/Alura relationship because it doesn’t work so there’s no real need to keep focusing on it. Alura might as well be another random super being that Kara enlists to help her with problems because there is little to no emotional impact with her being there. We do get the requisite “I’m so proud of you” moment but Alura ends up leaving with no fanfare as the show focuses on what’s actually important to Kara in the context of the world that has been set up around her. Before that happens the Reign problem needs to be dealt with. There’s a really bizarre stop/start approach taken to the threat Reign represents here. The episode picks up from last week with Reign manipulating the Earth’s core to turn it into Krypton and Team Supergirl dealing with the fallout of that. It’s a very chaotic yet impressive action sequence that makes great use of the different characters. Kara and Alura destroy rubble with their heat vision, Mon’El does what he can, James works to protect people as best he can and an eleventh hour appearance from Imra and Brainy help avert a city destroying tidal wave. When the production team really put their minds to crafting an action sequence we get something like this and it makes for a great spectacle. Kara’s direct Star Wars reference was a nice touch as well. The resolution of this sequence delivered something that the show has been lacking in recent times; emotional investment. One of the stronger aspects of the season has been the J’Onn and M’Yrnn relationship. Everything from them reconnecting after so long apart and his illness has been really well handled though the latter has been somewhat rushed in order to get to this conclusion. 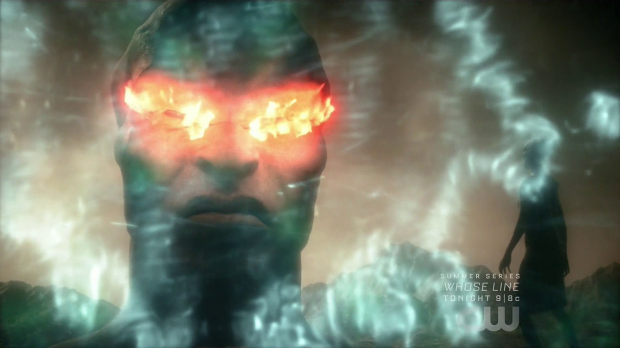 Last week saw the transference of M’Yrnn’s memories therefore sealing his fate and this week sees M’Yrnn meet his end. There is the obvious tragedy associated with the loss of his life but there is a deeper significance that comes with the memory transference process being incomplete meaning that part of M’Yrnn is lost forever. It isn’t something the episode dwells on and J’Onn seems to focus on the fact that he has so much of his father’s essence within him. The final moments that J’Onn and M’Yrnn share are brilliantly acted by David Harewood and Carl Lumbly who bring this fascinating relationship to such a wonderful close. I wonder if the sacred scrolls memory will come into play at some point next season or if it was just supposed to signify the passing on of culture and tradition. With that memory J’Onn is now all that keeps the memory of the Green Martians alive which makes M’Yrnn’s death Shakespearean in the sense that it’s a tragedy that sets J’Onn on an unexpected path. His priorities have definitely shifted after the loss of his father and I’m interested to see what this new direction will involve should David Harewood return to the show. Once the Earth is saved the episode takes a break from the urgency of the Reign plot to allow the characters to touch base. Imra and Brainy’s return from the future is all about resolution and looking ahead. Imra has a conversation with Mon’El that basically releases him from their marriage with absolutely no guilt because she has come to realise that it wasn’t working for either of them. Considering this was a major source of conflict earlier in the season this feels frustratingly convenient and the whole discussion lacks any real weight. The show has struggled to establish a baseline for the Mon’El/Imra relationship anyway but this neat sweeping resolution feels clumsy and forced. Brainy arrives with news that he can’t return to the future because the changes made to it after the defeat of Pestilence mean that all Artificial Intelligences are in serious danger meaning that Brainy has to stay in the present day in order to protect himself. It also turns out that Winn is a celebrated genius in the future because his designs end up being the inspiration for really advanced technology that benefits countless people. Brainy tells Winn that he has to go to the future and use his intelligence to make it safe for artificial beings. Naturally this is a lot for Winn to take in. He recently mentioned that he had the inkling that his potential had been somehow unfulfilled and this is clearly an extension of that idea to allow him to perhaps live up to everything that he’s capable of. The decision to leave for the future is something he wrestles with for a brief period before deciding that it’s something that he really has to do. His goodbye is the most moving part of the episode. 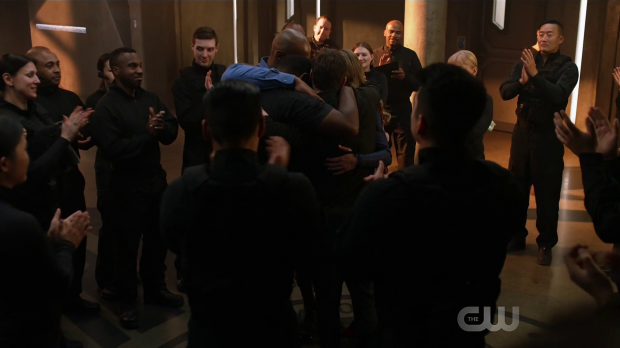 It makes great use of the rapport he has built between all of the characters and the show gives Winn the send off that he deserves. His departure is given the respect and impact that it deserves. The resolution of the Reign story is clunky in all sorts of ways. Serena and her companions are given so little focus that they might as well not be there though their overall weakness as villains makes the lack of screen time feel for the best. Sam’s trip to the Dark Valley makes no real sense no matter what way you decide to look at it as the writers never seemed to figure out if she was really going there or if it was some sort of spiritual journey. The appearance of a representation of Patricia makes this even more confusing as it’s unclear whether it is something conjured up by Sam to help her accomplish her task or if it is actually the disembodied spirit of her mother. Either way it’s all about drinking the right water so that Sam can unlock the Kryptonian potential that exists within her so that she can take on Reign. It doesn’t make a lot of sense and doesn’t really amount to anything. There should be more heft to Sam facing up against the physical representation of her dark side but there just isn’t and the whole thing is resolved a little too neatly. 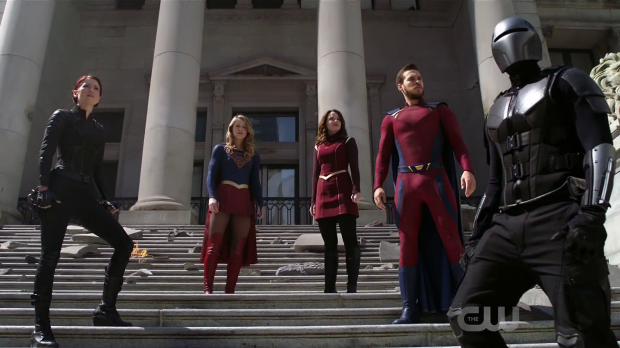 Team Supergirl taking on Reign within the fortress of Sanctuary is another visually impressive spectacle that is nicely fast paced and kinetic. 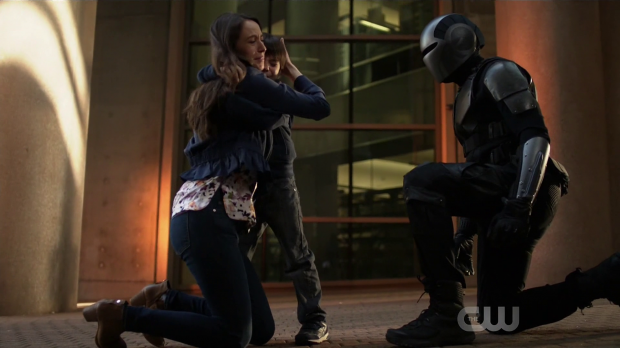 Reign’s violent reaction to her own death causing her to lash out with her heat vision which leads to the death of Mon’El, Sam and Alura was impressively shocking with a nicely played shell shocked reaction from Kara who refuses to accept it and immediately chooses to go back in time to change the outcome without really considering the consequences of that decision. She makes reference to losing sight of what she stands for which sounds profound but doesn’t really mean anything when some thought is given to it. Taken at face value it just comes across as Kara being unable to deal with loss which causes her to callously decide to change the outcome. After this point it appears that everything works out for the best which means that within the Arrowverse it’s apparently only Barry Allen who isn’t allowed to change the timeline without constantly being punished for it. The end of the episode suggests that there are consequences for her actions to be explored next season so we’ll see if this ends up being framed as a mistake or not. Alura heads back to Argo City, Kara decides definitively that her place is on Earth and Sam’s DNA is 100% Human so all’s well that apparently ends well. There are some things that are less neat such as Mon’El leaving for the future because the Legion apparently need his leadership. Weirdly this means that Mon’El and Imra are Legion teammates after mutually deciding to end their marriage. The goodbye between Kara and Mon’El is oddly stilted considering how heavily the show has been focusing on their relationship. It has often received focus at the expense of other more interesting relationships so seeing it so casually cast aside is bizarre. Sam’s DNA being completely Human leaves her future up in the air. If she returns next season then I can’t see what her purpose would be unless she becomes the head of CatCo and breathes new life into that all but discarded setting. If she doesn’t come back then it might be for the best since her storyline is all but resolved. I was disappointed in how this played out as it didn’t emphasise the mother/daughter connection between Sam and Ruby as the thing that tethered Sam to her Humanity and made her stronger than Reign. Everything was in place to make good use of this and the show just doesn’t do that. James ends the season with his Guardian identity outed to the public. He makes a snap decision early in the episode to unmask in front of a hysterical parent worried for the safety of her child and realises that the lack of hesitation associated with that action shows that he’s ready for his identity to be made public. The consequences of his decision remain to be seen though this could indicate that the show is severing the CatCo aspect which would make sense given the almost total lack of coverage it has received of late. 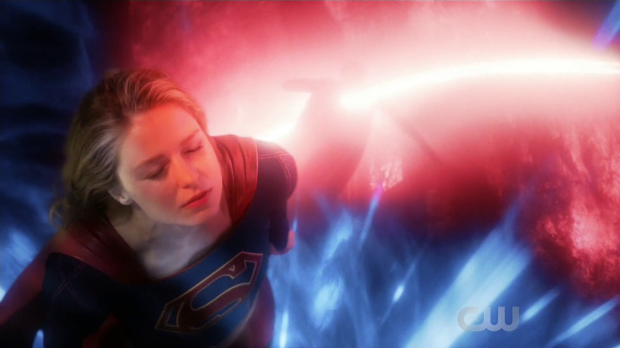 Kara’s decision to stay on Earth is necessary for the show to continue. What doesn’t work is how casually that decision is apparently made. There’s no real moment where she realises what her place is beyond telling Alex that there was one so the decision feels somewhat empty. Argo City is still out there as is her mother so Kara has gained a lot without really losing anything. I wouldn’t be surprised if Argo City becomes a semi regular fixture that is at least periodically mentioned as somewhere that Kara visits. Alex tries to resign from the DEO because she wants to stop putting her life in danger so that she can begin the process of adopting a child. In order to do that she has to live a less dangerous life which means putting the DEO behind her. Instead it’s J’Onn that steps down due to his altered priorities with Alex promoted to his former position. This will allow her to continue the work she is so good at in a less life threatening way and raise a child so effectively she gets the best of both worlds. It’s a bold and interesting new direction for Alex that will be interesting to see play out next season. The end of the episode brings two teases for next season. Lena is shown working on the rock of Yuda Kal which hints that she might be headed down that villainous path I really wanted the show to avoid. It is still ambiguous and may not head in that direction but it’s certainly an ominous moment with the mention of “phase two”. The closing moments of the episode show a duplicate Kara in Siberia which sets up another conflict for next season to play with. A muddled finale that casts aside the recently problematic storytelling in favour of setting up elements to be explored next season. The resolution of the Reign plot was weak and confusing with no real emotional heft to the defeat. Nothing is made of Sam overcoming her dark side and her trip to the Dark Valley is more confusing than satisfying. The time travel resolution feels very half baked though at least there appears to be consequences. There are some impressive set piece moments such as the opening protection of National City and the fight within the fortress of Sanctuary. It’s a testament to the production team that they can consistently make entertaining action sequences that use the various characters well. The death of M’Yrnn and the passing on of an important cultural memory is superbly acted and appropriately moving. The lasting impact this has on J’Onn in terms of how he will choose to live his life from then on has some real potential as well. Winn’s leaving is the most moving part of the episode as it gives him an appropriately weighty goodbye that summarises his relationships with the various characters nicely. Kara’s decision to stay on Earth is necessary for the show to continue but the profound realisation of where she belongs doesn’t really exist so it does feel like a necessity based decision. It’s probably for the best since her relationship with Alura never quite landed so sweeping that aside is probably the best that could be hoped for at this stage. Similarly Mon’El being released from his marriage to Imra because she realise it wasn’t the best thing for either of them comes across as far too neat only to have Mon’El leave for the future anyway. It’s a bizarre moment given the focus on the Mon’El/Kara relationship at the expense of more interesting connections. Alex being promoted to the position of director feels like an important step forward for her as it moves the character on while allowing her to begin the process of adopting a child. James having his Guardian identity outed to the public works well enough after the obvious yet effective moment showing he was ready for that to happen and the suggestion that Lena might be heading down a darker path feels unnecessary yet somewhat interesting. There was a lot of change in this particular episode and some of it has been discussed in a finale post mortem interview. Different characters moved onto other things that will make up at least some of their narrative next season. Strangely Kara is the one who changes the least because she comes to a realisation that Earth is where she belongs and ends the season with a renewed commitment to her Supergirl role. This makes sense given that she is the lead and the show is about her but it also feels that she is stagnating slightly. There’s a risk that she will be more reactive to things that happen next season rather than developing in satisfying ways. Not having Mon’El around should encourage focus on different relationships for Kara and that definitely has a lot of potential. It was recently reported that Winn will be a recurring character rather than a series regular next season. Unfortunately that means a downgrade for Jeremy Jordan in terms of status on this show. We will see Winn but not nearly as often which I find to be a shame as he has the most potential for interesting development. It’s possible that fewer appearances mean that he’ll get that and when he does appear it will be meaningful but there’s no denying that the show is losing a full time character who could have been so much more. On the plus side Brainy is taking his place so that’s definitely something to look forward to. James will likely have an arc focused on the public reaction to him outing himself as Guardian. There are a lot of places this can go such as potentially being arrested for acting as a vigilante, finding it difficult to have a normal life or possibly losing his job as a result of his extracurricular activities. I think James functions much better when he is the moral compass for other characters and doesn’t fare as well when given his own arcs to follow. Smarter writing can easily fix this but I’m not convinced Guardian being a hero the public can look up to is the best approach for a James centric storyline. Alex’ promotion to director of the DEO brings with it a lot of interesting possibilities particularly if she adopts a child and finds it difficult to divide her time. A lot of her contribution to the most recent episodes has been learning parenting lessons and realising the notion isn’t always as romantic as she thinks it is. After having learned those lessons she seems more determined to become a mother so it’ll be interesting to see how she finds the reality of raising a child while also maintaining a demanding career. If J’Onn remains in the show I’d like to see him maybe go down the route of becomig a detective as the Martian Manhunter sometimes is in the comics. I’m not sure how such a thing would fit into the tapestry of the show but it would certainly add some much needed variety to the setup and allow for different sorts of storytelling. I’m all for that if it can work and I certainly wouldn’t mind David Harewood having some form of partially disconnected subplot. The Lena cliffhanger is deliberately ambiguous as to what her future intentions are but I’m willing to believe that they are fundamentally good even if her morality clashes with Kara’s at certain points. A lot of work was done to make the Lena/Kara connection strained because of Lena’s dislike for Supergirl in recent episodes so I’d be interested to see that develop and have that affect the civilian friendship that Kara tries to maintain. As to the duplicate Kara cliffhanger it has already been reported that this will be an adaptation of Superman: Red Son. I suspect major liberties will be taken with that story but tackling a version of that is compelling by itself. Above all I hope the show regains some focus overall and resumes focusing on character rather than story.